Fair Winds Press, 9781592337224, 224pp. Nancy Ripton is a writer and editor with two decades of experience in consumer publishing, writing for publications such as Pregnancy, Fit Pregnancy, More, Elle, Glamour, Men's Fitness and many more. She has worked as an editor-in-chief of various magazines including Oxygen, glow and (her current position) at Inside Fitness Women. With a background as a personal trainer and fitness program director, Nancy has always been passionate about health, fitness, nutrition and learning new ways to strive towards optimal health. Nancy is a mother of three, and co-founded JustTheFactsBaby.com after having her first child nine years ago. She has become a go-to online voice for trusted, well-researched parenting advice. This is her first book. Melanie Potock, MA, CCC-SLP is a pediatric feeding specialist and certified speech language pathologist. Her practice focuses on the family and teaching the fundamentals of parenting in the kitchen. Melanie has over 15 years of experience helping babies, children and teens learn to eat a variety of healthy foods. The spectrum of kids on her caseload includes children with significant medical issues to the garden-variety picky eater. Melanie's extensive knowledge of how children learn the developmental process known as "feeding" and her joyful approach in supporting the whole family on their feeding journey is the perfect combination and leads to happier, healthier mealtimes for everyone. Melanie is the coauthor of Raising a Healthy, Happy Eater and author of Happy Mealtimes with Happy Kids. "Baby Self-Feeding features research and recommendations that are sure to help your child become a healthy eater for life! This book addresses common practical issues such as introducing first foods and choosing feeding accessories such as high chairs, mixed in with nutritional information and health concerns, including allergies and choking prevention. 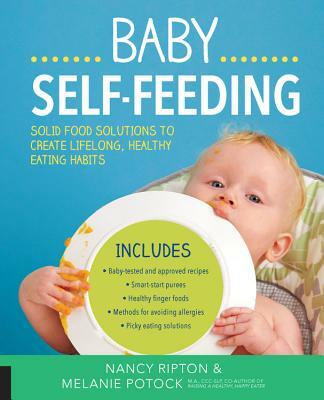 It is a great resource for your baby's formative feeding years!" "What a fun read! This adorable, thorough guide leaves no dish un-turned. It's ideal for first-time parents, or for the seasoned mom or dad who finds themselves with a challenging eater. It's also a great reminder that modeling great food habits is an important part of parenting." "As both a mother and a pediatrician, I see firsthand how early experiences with food can set the stage for a healthy, happy lifetime of eating. Baby Self-Feeding beautifully illustrates how to ensure that a baby's first feeding experience is not only nutritious but also enjoyable."